..... for Humans and Horses too! 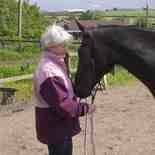 If you are seeking another way of approaching either your own health or that of your horse then the services I offer could be of interest to you. Over the last few years I have developed an increasing interest in the field of alternative and complementary health which has led me to explore various therapies and practices. During this period I have realised that there is a place for many different approaches to health depending on an individual’s requirements at any given time however, the method that I have found to be the most powerful for humans is something called Vibrational Medicine. My training with The Scottish School of Vibrational Medicine in Nairn was carried out over a two year period and I qualified as a practitioner in October 2011. Having been involved with horses for a number of years I was seeking a way of promoting their health and wellbeing when I heard about Equine Touch through the Natural Horsemanship community. Equine Touch is a form of bodywork which emphasises addressing the whole horse not just the area that appears to have a problem. This aspect really appealed to me so I decided to explore the method further and once I had completed the Level 1 course I was hooked! Having subsequently passed my Level 1, 2 and 3 assessments I am now continuing training to become an Equine Touch Practitioner.